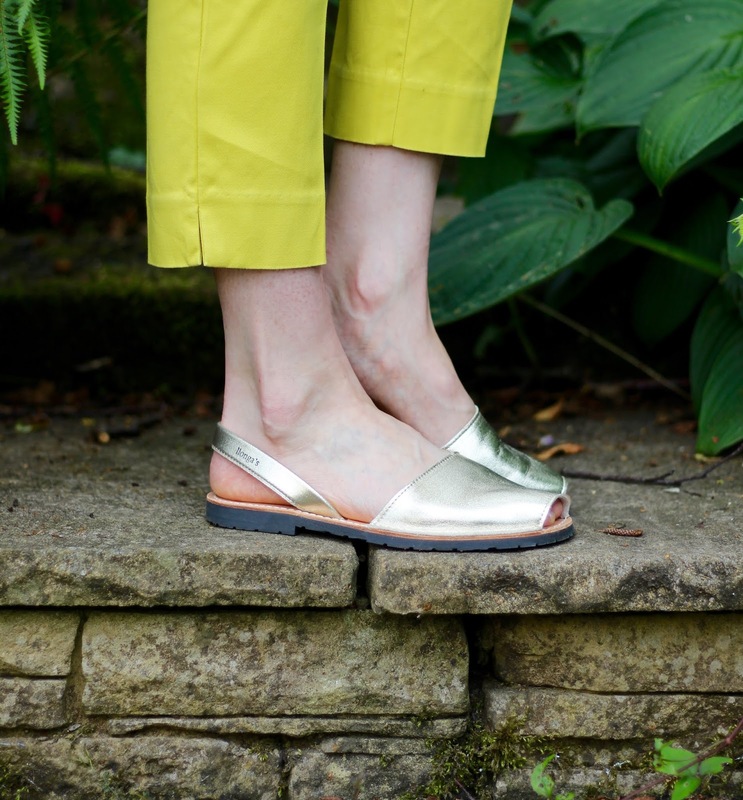 Colourful trousers are surprisingly easy to style, and much more versatile than they should be! I've worn them countless times and they have been styled in many ways. HERE,yellow trousers with trainers and a band jacket. 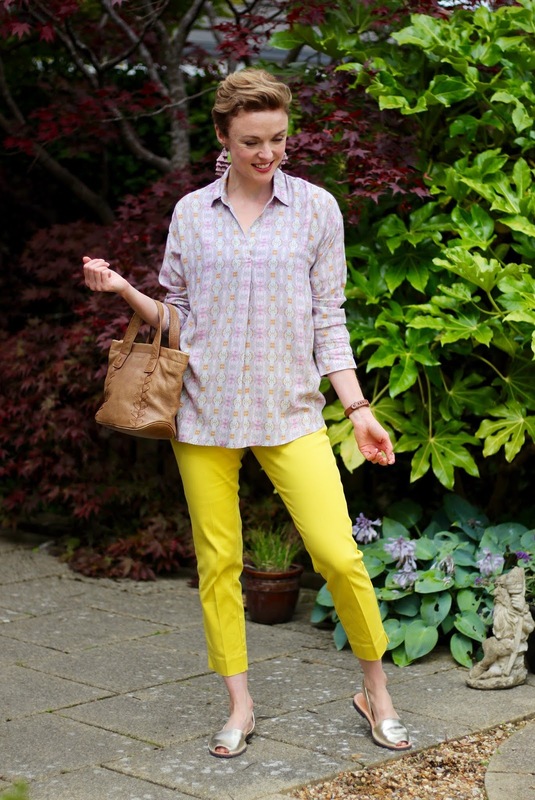 HERE,yellow trousers with a chambray shirt and pink heels. and HERE,yellow trousers with boots and a geeky cardigan. They even made their way into a capsule wardrobe HERE. Bold coloured trousers CAN work as a basic in your wardrobe. It's all a question of your personal taste. Depending on your style (or your mood on that day) the shirt you choose to pair with your bright trousers can change the look of them dramatically. Then you also have the option of tucking or not-tucking... or half tucking! And we all know that accessories are the game changer. Today I'm wearing a floaty shirt that feels light and breezy and I've left it to hang loose. Tucking tops in always smartens up a outfit, and also makes our legs look longer, BUT some days we just need a bit of float and flow, don't we? 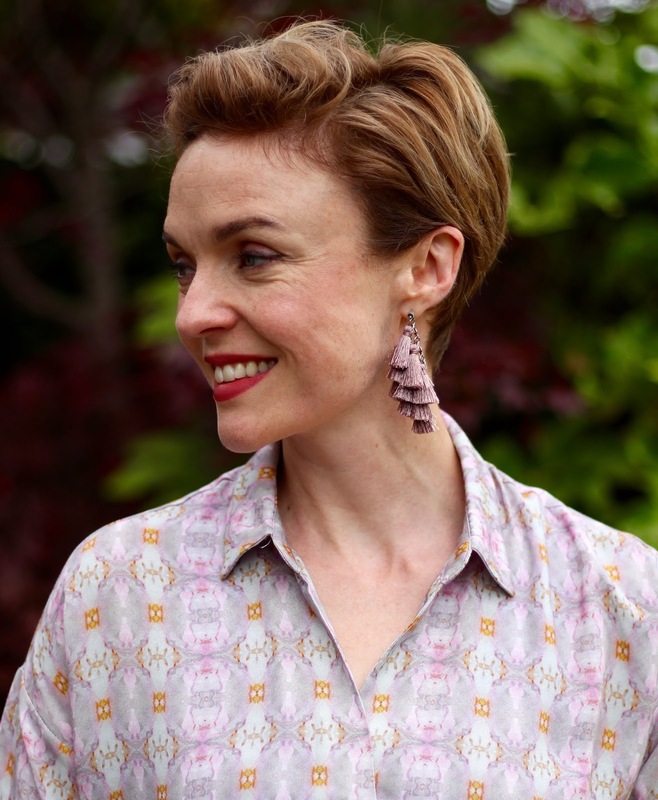 This shirt was sent to me by a company called Silver Pink and I love the fabric and the original pattern design! Soft tones like this are certainly not my usual style, but I've been drawn to more delicate patterns/fabrics this summer. Maybe it's the unusual heat or maybe it's just the mood I'm in. Whatever the reason, all things 'pretty' are really appealing! This outfit was perfect for errand running as I was comfortable, cool and smart enough to be taken seriously. I don't know about you but I feel like I am given better service when I am dressed just a little smarter than jeans? Simple Minorcan sandals, fun tassel earring and an older-than-time grab bag finished things off perfectly. SHIRT: c/o Silver Pink... it comes in two designs. EARRINGS: I can't remember... try these. I love this color combination---it's so fun and modern!! I love this outfit, Sam! The colours too. I'm like you, every now and again, it's just nice to wear a shirt hanging out. Hanging out is SO much more comfortable isn't it Suzy? what a comfy&cool outfit, you look cute, elegant and ready to run errands!. 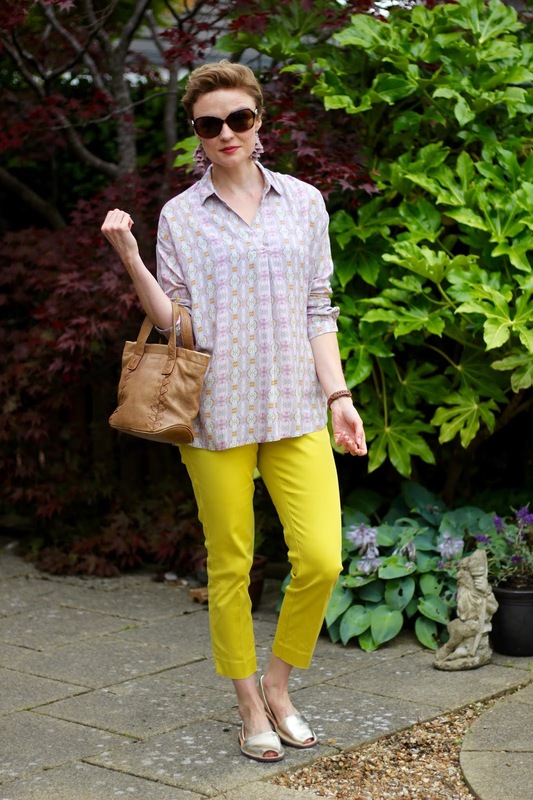 I love your yellow trousers, they're such a versatile piece! I think that dressing up even in a heatwave is important, it makes me feel better and like I'm giving a better service (I totally agree!). I'm glad it's not just me who thinks this Monica! I'm sure people take us more seriously when we are dressed just a little smarter. After seeing you wear these yellow pants in a post from last summer I snatched up a couple of pairs!! Yellow is quintessentially cheery but isn't the best with my complexion. Worn on my lower half it's totally perky and fun!! You're so inspiring Sam!!! This blouse is really lovely. The print reminds me of tiny Rorschach prints! Such a flattering mix of soft colors! Yellow trousers are surprisingly versatile aren't they?? This blouse is so soft and comfortable... nice and cool too! Those trousers are fabulous! I agree that color can be "neutral", great to mix and match. You know I love color! These trousers look wonderful on you and i love that they are paired with this pretty blouse with some soft purple tones. 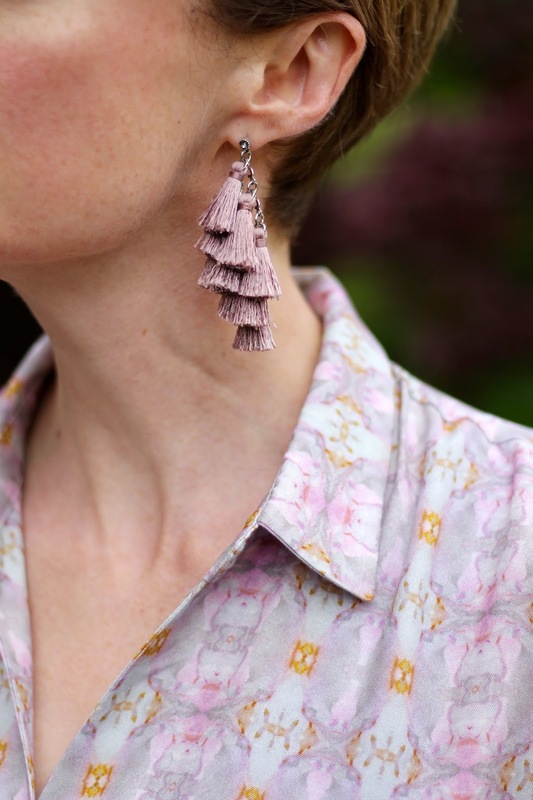 Great earrings too! Fun to try different color combos- looking effortlessly cool-even in this heat! I could see you in this blouse Jess... and the trousers too! !